West Virginia is a state in the Appalachia/Upland South region of the United States. West Virginia broke away from Virginia during the American Civil War and was admitted to the Union as a separate state on June 20, 1863. It is the only state formed as a direct result of the Civil War, and the only state to form by seceding from a preexisting state. West Virginia is one of the Border States. The state's Northern Panhandle, and North-Central region, is tied to Pittsburgh, Pennsylvania. Also, those in the Eastern Panhandle are connected with the Washington, D.C. suburbs in Maryland and Virginia, and southern West Virginians often consider themselves Southerners. Finally, the towns and farms along the mid-Ohio River have an appearance and culture somewhat resembling the Midwest. The state is noted for its great natural beauty, its historically significant logging and coal mining industries, and its labor history. It is also well known as a tourist destination for those people interested in outdoor activities such as skiing, whitewater rafting, rock climbing, fishing, hiking, and hunting. 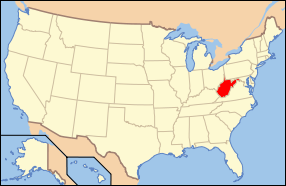 West Virginia is bordered by Pennsylvania to the north; by Ohio to the north and west; by Kentucky to the west; by Maryland to the north and east; and by Virginia to the east and south. The Ohio and Potomac rivers form parts of the boundaries. West Virginia is the only state in the nation located entirely within the Appalachian Mountain range, and in which all areas are mountainous; for this reason it is nicknamed "The Mountain State." About 75 percent of the state is within the Cumberland Plateau and Allegheny Plateau regions. Though the relief is not high, the plateau region is extremely rugged in most areas. On the eastern state line with Virginia, high peaks in the Monongahela National Forest region give rise to an island of colder climate and ecosystems similar to those of northern New England and eastern Canada. The highest point in the state is atop Spruce Knob, which at 4,863 feet (1,482 m) is covered in a boreal forest of dense spruce trees at altitudes above 4,000 feet (1,220 m). Spruce Knob lies within the Monongahela National Forest and is a part of the Spruce Knob-Seneca Rocks National Recreation Area. A total of six wilderness areas can also be found within the forest. Outside the forest to the south, the New River Gorge is a 1,000-foot (304 m) deep canyon carved by the New River. The National Park Service manages that part of the gorge and river designated as the New River Gorge National River, one of only 15 rivers in the U.S. with this level of protection. The native vegetation for most of the state was originally mixed hardwood forest of oak, chestnut, maple, beech, and white pine, with willow and American sycamore along the state's waterways. Many of the areas are rich in biodiversity and scenic beauty. Ecologically, most of West Virginia falls into the Appalachian mixed mesophytic forests ecoregion. The underlying rock strata are sandstones, shales, bituminous coal beds, and limestones laid down in a near shore environment from sediments derived from mountains to the east, in a shallow inland sea on the west. Some beds illustrate a coastal swamp environment, some river delta, some shallow water. Sea level rose and fell many times during the Mississippian and Pennsylvanian eras, giving a variety of rock strata. The Appalachian Mountains are some of the oldest on earth, having formed over 300 million years ago. The climate of West Virginia borders on a humid subtropical climate (Koppen climate classification Cfa) in the lower elevations of the extreme southwestern part of the state (including Huntington) and parts of the Eastern Panhandle east of the Appalachians with hot, humid summers and milder winters. The rest of the state has a humid continental climate (Koppen climate classification Dfa, or Dfb at the higher elevations) with warm to hot, humid summers and cold winters, increasing in severity with elevation. However, the weather is subject in all parts of the state to change. The hardiness zones range from zone 5b in the central Appalachian mountains to zone 7a in the warmest parts of the lowest elevations. In the Eastern Panhandle and the Ohio River Valley temperatures are warm enough to see and grow subtropical plants, such as Southern magnolia (Magnolia grandiflora), Crepe Myrtle, Albizia julibrissin, American Sweetgum, and even the occasional needle palm and sabal minor. These plants don't thrive as well in other parts of the state. Average January temperatures range from around 28°F (-2°C) near the Cheat River to 43°F (5°C) along sections of the border with Kentucky. July averages range from 67°F (19°C) along the North Branch Potomac River to 76°F (24°C) in the western part of the state. It is cooler in the mountains than in the lower sections of the state. Annual precipitation ranges from less than 32 inches (810 mm) in the lower eastern section to more than 56 inches (1,400 mm) in higher parts of the Allegheny Front. Slightly more than half the rainfall occurs from April to September. Dense fogs are common in many valleys of the Kanawha section, especially the Tygart Valley. Snow usually lasts only a few days in the lower sections but may persist for weeks in the higher mountain areas. An average of 34 inches (86 cm) of snow falls annually in Charleston, although during the winter of 1995-1996, more than three times that amount fell as several cities in the state established new records for snowfall. Many ancient human-made earthen mounds from various mound builder cultures survive, especially in the areas of Moundsville, South Charleston, and Romney. Although little is known about these civilizations, artifacts found there are evidence of a complex, stratified culture with metal tools and implements. By 1600, organized tribes such as the Delaware and Shawnee had moved into the area. The Iroquois Confederacy of Cayuga, Mohawk, Oneida, Onondaga, and Seneca, and eventually the Tuscarora began to move into the area from present-day New York. This Six Nation Confederacy dominated the area, but allowed other tribes to remain in the area. The Ohio Valley area of what was then western Virginia began to attract European colonists during the 1600s. As a result, the Native Americans were forced west, while many succumbed to disease and warfare. The Six Nations tribes formed alliances with both the British and French, who were fighting each other for dominance of the "New World." In 1671, General Abram Wood, at the direction of Royal Governor William Berkeley of the Virginia Colony, sent a party that discovered Kanawha Falls. In 1716, Governor Alexander Spotswood and about thirty horsemen made an excursion into what is now Pendleton County. John Van Metre, an Indian trader, entered the northern region in 1725. The same year, German settlers from Pennsylvania founded New Mecklenburg, the present Shepherdstown, on the Potomac River. King Charles II of England, in 1661, granted to a company of gentlemen the land between the Potomac and Rappahannock rivers, known as the Northern Neck. The grant finally came into the possession of Thomas Fairfax, 6th Lord Fairfax of Cameron, and in 1746, a stone was erected at the source of the North Branch Potomac River to mark the western limit of the grant. A considerable part of this land was surveyed by George Washington between 1748 and 1751. His diary indicates that many squatters, mostly German, were living along the South Branch Potomac River. Christopher Gist, a surveyor for the first Ohio Company, explored the country along the Ohio River north of the mouth of the Kanawha River, between 1751 and 1752, with the aim of establishing a fourteenth colony named Vandalia. Many settlers crossed the mountains after 1750, encountering Native American resistance. Apparently, few Native Americans lived within the present limits of the state, but the region was a common hunting ground, crossed also by many war trails. During the French and Indian War, the scattered settlements were mostly destroyed. Native American attacks continued until after the American Revolutionary War. During the war, the settlers in Western Virginia were generally active Whigs and many served in the Continental Army. Social conditions in western Virginia were entirely unlike those in the eastern portion of the state. A movement to create a state beyond the Alleghenies was revived and a petition for the establishment of "Westsylvania" was presented to Congress, with the argument that the mountains made an almost impassable barrier on the east. The rugged nature of the country made slavery unprofitable, and time only increased the social, political, economic, and cultural differences. The convention that met in 1829, to form a new constitution for Virginia, against the protest of the counties beyond the mountains, required a property qualification for suffrage and gave the slave-holding counties the benefit of three-fifths of their slave population in apportioning the state's representation in the U.S. House of Representatives. As a result, every county beyond the Alleghenies except one voted to reject the constitution, which nevertheless passed because of eastern support. Though the Virginia Constitution of 1850 provided for white male suffrage, the distribution of representation among the counties continued to give control to the section east of the Blue Ridge Mountains. West Virginia is the only state in the Union to secede from another state, Virginia, in U.S. history. On April 17, 1861, fifteen of the forty-six delegates from the area located in the present state of West Virginia voted to secede from the United States. 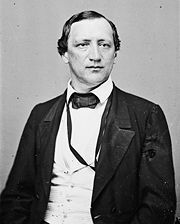 Almost immediately after the vote to proceed with secession prevailed in the Virginia General Assembly, a mass meeting at the town of Clarksburg recommended that each county in northwestern Virginia send delegates to a convention to meet in Wheeling on May 13, 1861. When this First Wheeling Convention met, 425 delegates from 25 counties were present, with more than one-third of the delegates from the northern panhandle area. On May 23 1861, secession from the U.S. was ratified by a large majority in the state as a whole, with the western counties voting approximately 34,677 against and 19,121 for. The Second Wheeling Convention met as agreed on June 11, and declared that, since the Secession Convention had been called without the consent of the people, all its acts were void, and that all who adhered to it had vacated their offices. The Wheeling Conventions, and the delegates themselves, were never actually elected by public ballot to act on behalf of western Virginia. An act for the reorganization of the government was then passed on June 19. The Wheeling Convention members met on June 20, and organized a state government, electing two U.S. senators who were recognized at Washington, D.C. At that point, therefore, there were two state governments in Virginia, one pledging allegiance to the United States and one to the Confederacy. The Wheeling Convention, which had taken a recess until August 6, then reassembled on August 20, and called for a popular vote on the formation of a new state and for a convention to frame a constitution if the vote should be favorable. At the election on October 24, 1861, 18,489 votes were cast for the new state and only 781 against. The convention began on November 26, 1861, and finished its work on February 18, 1862, and the instrument was ratified (18,162 for and 514 against) on April 11, 1862. On May 13, the state legislature of the reorganized government approved the formation of the new state. An application for admission to the Union was made to Congress, and on December 31, 1862, an enabling act was approved by President Abraham Lincoln admitting West Virginia, on the condition that a provision for the gradual abolition of slavery be inserted in the Constitution. The Convention was reconvened on February 12, 1863, and the demand was met. The revised constitution was adopted on March 26 1863, and on April 20 1863, President Lincoln issued a proclamation admitting the state at the end of sixty days (June 20 1863). The question of the constitutionality of the formation of the new state was brought before the Supreme Court of the United States: The Virginia General Assembly repealed the act of secession and, in 1866, brought suit against West Virginia asking the court to declare the counties a part of Virginia. The U.S. Congress, however, passed a joint resolution recognizing the transfer on March 10, 1866. The Supreme Court, in 1870, decided in favor of West Virginia. During the American Civil War, West Virginia suffered comparatively little. George B. McClellan's forces gained possession of the greater part of the territory in the summer of 1861, and Union control was never seriously threatened, in spite of the attempt by Robert E. Lee in the same year. In 1863, General John D. Imboden, with 5,000 Confederates, overran a considerable portion of the state. Bands of guerrillas burned and plundered in some sections, and were not entirely suppressed until after the war ended. The area which became West Virginia furnished about an equal amount of soldiers to the Federal and Confederate governments, approximately 22-25,000 each. The Wheeling government disenfranchised returning Confederate soldiers in 1865. In addition, Confederates' property could be confiscated, and in 1866, a constitutional amendment disfranchised all who had given aid and comfort to the Confederacy. Shifting political control in the state led to the abrogation of the 1866 amendment, and eventually, an entirely new state constitution was adopted on August 22, 1872. West Virginia's capital and seat of government is the city of Charleston, located in the southwest area of the state. Charleston, founded in 1794, was built on a settlement near the mouth of the Elk River dating from 1788. Once West Virginia was finally proclaimed a state by President Lincoln, a new state capital had to be named. The capital shifted between Charleston and Wheeling for several years until Charleston was finally chosen by popular vote in 1877. The first capitol building was built in 1885. The current structure was dedicated in 1932, after the first burned down. The governor of West Virgina is elected every four years, on the same day as the U.S. Presidential election, and is sworn in during the following January. Governors of West Virginia can serve two consecutive terms, but must sit out a term before serving a third term in office. Other elected officials in the executive branch include the Agriculture Commissioner, Auditor, Attorney General, Secretary of State, and Treasurer. The West Virginia Legislature is bicameral, consisting of the House of Delegates and the Senate. It is a citizen's legislature, meaning that legislative office is not a full-time occupation, but rather a part-time position. Consequently, the legislators often hold a full-time job in their community of residence. Typically, the legislature is in session for 60 days between January and early April, closing at midnight on the last day of the session. During the remainder of the year, monthly interim sessions are held in preparation for the regular session. Legislators also gather periodically for "special" sessions when called by the governor. West Virginia’s highest court is the Supreme Court of Appeals. The Supreme Court of Appeals of West Virginia is the busiest appellate court of its type in the United States. West Virginia is one of 11 states with a single appellate court. The state constitution allows for the creation of an intermediate court of appeals, but the Legislature has never created one. The Supreme Court is made up of five justices, elected in partisan elections to 12-year terms. For the purpose of courts of general jurisdiction, the state is divided into 31 judicial circuits. Each circuit is made up of one or more counties. Circuit judges are elected in partisan elections to serve eight-year terms. West Virginia is one of twelve states that does not have a death penalty. West Virginia is an alcoholic beverage control state. It retains a monopoly on wholesaling of distilled spirits and does not operate retail outlets. West Virginia counties administer and collect property taxes. Municipalities may levy license and gross receipts taxes on businesses located within the city limits and a hotel occupancy tax on lodging places in the city. Although the Department of Tax and Revenue plays a major role in the administration of this tax, less than one-half of one percent of the property tax collected goes to state government. The primary beneficiaries of the property tax are county boards of education. The WV Department of Tax and Revenue supervises and otherwise assists counties and municipalities in their work of assessment and tax rate determination. West Virginia has a history of supporting Democratic candidates in state and local elections. It also has a very strong tradition of union membership. While the state continued its Democratic tradition by supporting Bill Clinton by large margins in 1992 and 1996, a majority of West Virginia voters supported George W. Bush in 2000 and 2004. The most consistent support for Democrats is found in the coal region of southern West Virginia (especially McDowell, Mingo, Logan, Wyoming, and Boone Counties). Republicans dominate east of the Allegheny Mountains, especially in the state's Eastern Panhandle and Potomac Highlands. The Northern Panhandle and North-Central West Virginia regions usually split right down the middle in terms of being Republican or Democrat. Song: "The West Virginia Hills"
The economy of West Virginia is now one of the most fragile of any state in the U.S. According to U.S. Census Bureau data, West Virginia is the third lowest in per capita income, ahead of only Arkansas and Mississippi. It also ranks last in median household income. The proportion of West Virginia's adult population with a bachelor's degree is the lowest in the U.S., at 15.3 percent. Salt mining had been underway since the eighteenth century, though it had largely played out by the time of the American Civil War, when the red salt of Kanawha County was a valued commodity of first Confederate, and later Union forces. Later, more sophisticated mining methods would restore West Virginia's role as a major producer of salt. In the second half of the nineteenth century, the discovery of major deposits on bituminous coal led to the development of extensive transport networks and the expansion of industry throughout the U.S. The residents (both Native Americans and early European settlers) had known of the underlying coal and used it for heating and fuel. These very small "personal" mines were the only practical development, pre-railroads. After the Civil War, the new railroads were a practical means to transport large quantities of coal to expanding U.S. and export markets. As the anthracite mines of northwestern New Jersey and Pennsylvania were playing out, investors and industrialists focused on new interest in West Virginia's coal. Geologists such as Dr. David T. Ansted surveyed potential coal fields and invested in land and early mining projects. The completion of the Chesapeake and Ohio Railway (C&O) across the state to the new city of Huntington on the Ohio River, in 1872, opened access to the New River Coal Field. The C&O built a huge coal pier at Newport News, Virginia at the Virginia port of Hampton Roads. In 1881, the owners of the newly re-named Norfolk and Western Railroad (N & W) built the line to capture the coal production. Roanoke, Virginia, emerged as a trans-shipment point for West Virginia's coal on its way to the ports. In 1889, in the southern part of the state, along the Norfolk and Western rail lines, the coal center of Bluefield, West Virginia, was founded. 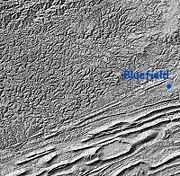 The "capital" of the enormous Pocahontas coalfield, Bluefield would be the largest city in the southern part of the state for decades. After Reconstruction, the new 35th state benefited from development of its mineral resources more than any other single economic activity. In northern West Virgina, and elsewhere, the older Baltimore and Ohio Railroad (B&O) and other lines expanded to take advantage of coal opportunities as well. The B&O developed coal piers in Baltimore and at several ports on the Great Lakes. Other significant carriers of WV coal were the Western Maryland Railway (WM), Southern Railway (SOU), and the Louisville and Nashville Railroad (L&N). By 1900, only the coalfields in the most rugged terrain of southern West Virginia were untapped. Within this area west of the New River Coalfield in Raleigh and Wyoming counties lay the Winding Gulf Coalfield, later promoted as the "Billion Dollar Coalfield." A short-line railroad was chartered to stretch between the C&O, along the Kanawha River, and the N&W at Matoaka, a distance of about 80 miles. With financial support from major industrialists, this railroad was eventually built across the state to the Hampton Roads port. After merging with the N & W, the two railroads created the modern Norfok Southern system. As coal mining and related work became a major employment activities in the state, there was considerable labor strife as working conditions, safety issues, and economic concerns arose. Even in the twenty-first century, mining safety and ecological concerns are challenging the state whose coal continued to power electrical generating plants in many other states. Coal is not the only valuable mineral found in West Virginia, as the state was the site of the 1928 discovery of the 34.48 carat (6.896 g) Jones Diamond. West Virginia also has some oil reserves but currently only has a few small to medium sized oil and natural gas fields being tapped. The Veterans Memorial Bridge, which carries U.S. Route 22. Farming is very limited in West Virginia because of the state's mountainous terrain. The chemical industry has its roots in the earliest salt mining carried out by Native Americans in the 1700s, using the salt brines of the Little Kanawha River. After the Civil War, when the salt mines started to run out, the manufacture of simple salt compounds like bromine and potassium salts began. Eventually, more complex manufacturing developed. Abundant natural resources, including carbon from coal, and hydropower from mountainous rivers fueled the expansion of the chemical industry all along the Kanawha Valley. The start of World War I led to increased demand for chemical compounds, and with the closing off of Germany's chemical industry, the allies and the rest of the world turned to West Virginia. DuPont, Carbide, and Monsanto, among others, expanded throughout the twentieth century. The chemical industry has expanded to include petrochemicals and synthetic materials. The industry has provided thousands of jobs and extensive infrastructure to West Virginia, however, concerns about exposure and epidemiologic evidence of cancer and other diseases resulting from air- and water-borne pollution, and more recently, potential terrorist threats have led to considerable regulation of the industry. Highways form the backbone of transportation systems in West Virginia, with over 37,300 miles of public roads in the state. Airports, railroads, and rivers complete the commercial transportation modes for West Virginia. Commercial air travel is facilitated by airports in Charleston, Huntington, Beckley, Bluefield, Lewisburg, Clarksburg, Martinsburg, Morgantown, Wheeling, and Parkersburg. West Virginia University in Morgantown boasts a PRT (personal rapid transit) system, the state's only single rail public transit system. Developed by Boeing, the WVU School of Engineering and the U.S. Department of Transportation, it was a model for low-capacity light transport designed for smaller cities. Rail lines in the state were once more prevalent, but many have been discontinued because of increased automobile traffic. Many old tracks have been converted to rail trails for recreational use, and the state is still served by a few commercial lines for hauling coal and by Amtrak. In 2006, Norfolk Southern, along with the West Virginia and U.S. Government approved a plan to modify many of the rail tunnels in West Virginia, especially in the southern half of the state, to allow for double stacked cars. This is expected to also help bring economic growth to the southern half of the state. Because of the mountainous nature of the entire state, West Virginia has several notable tunnels and bridges. 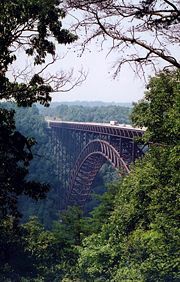 The most famous of these is the New River Gorge Bridge, which was at a time the longest steel single-arch bridge in the world with a 3,031-foot (924 m) span. The bridge is also pictured on the West Virginia state quarter. The Veterans Memorial Bridge (Weirton-Steubenville Bridge) was at its time of construction one of only three cable-stayed steel girder trusses in the United States. It connects Steubenville, Ohio, with Weirton, West Virginia, along U.S. Route 22. Education is overseen at the state level by the West Virginia Department of Education, which controls the State Board of Education, the WV Schools for the Deaf and Blind, Office of Education Performance Audits, and the Regional Education Service Agencies. West Virginia University in Morgantown, Marshall University in Huntington, and West Virgina State University in Institute are among the public colleges and universities in the state. As of 2005, West Virginia had an estimated population of 1,816,856, an increase of 4,308, or 0.2 percent, from the prior year and an increase of 8,506, or 0.5 percent, since the year 2000. This includes a natural decrease since the last census of 3,296 people (that is 108,292 births minus 111,588 deaths) and an increase from net migration of 14,209 people into the state. Immigration from outside the United States resulted in a net increase of 3,691 people, and migration within the country produced a net increase of 10,518 people. Only 1.1 percent of the state's residents were foreign-born, placing West Virginia last among the 50 states in that statistic. It has the lowest percentage of residents that speak a language other than English in the home (2.7 percent). The five largest ancestry groups in West Virginia are: American (23.2 percent), German (17.2 percent), Irish (13.5 percent) (Most actually Scots-Irish), English (12 percent), Italian (4.8 percent). West Virgina has a culture of strong self-reliance developed through its early, and continued, isolation. Largely unaffected by circumstances taking place outside the mountain settlements, its rural regions retain a unique culture. Musical instruments, ballads, and handicrafts from generations past remain. The state has taken advantage of its unique cultural heritage and traditions, promoting them through tourism. One of West Virginia's greatest natural resources is its pristine mountain environment. There are over 35 state parks. Numerous festivals—ethnic, heritage, craft, and food, among others—take place annually in these parks and throughout the state. ↑ 2.0 2.1 2.2 Elevations and Distances in the United States. United States Geological Survey (2001). Retrieved October 24, 2011. ↑ West Virginia Division of Culture and History, An Introduction to West Virginia's Ethnic Communities. Retrieved December 25, 2007. ↑ Monongahela National Forest, Welcome to the Monongahela National Forest. Retrieved December 25, 2007. ↑ West Virginia Division of Culture and History, Native American Clashes with European Settlers. Retrieved December 25, 2007. ↑ West Virginia Division of Culture and History, A State of Convenience, the Creation of West Virginia, Reorganized Government of Virginia Approves Separation. Retrieved December 25, 2007. ↑ Charles Ambler, The History of West Virginia (1933), p. 309. ↑ J. McGregor, The Disruption of Virginia, p. 193. ↑ Richard O. Curry, A House Divided, p. 147. ↑ Find Law, Virginia v. West Virginia, 78 U.S. 39 (1870). Retrieved June 16, 2008. ↑ West Virginia Division of Culture and History, Researching your Civil War Ancestor. Retrieved December 25, 2007. ↑ Charleston Convention & Visitors Bureau, Your Doorway to West Virginia. Retrieved December 25, 2007. ↑ State of West Virginia, Executive Branch. Retrieved December 25, 2007. ↑ U.S. Census Bureau, State Rankings—Personal Income Per Capita In Constant (2000) Dollars 2004. Retrieved December 25, 2007. ↑ U.S. Census Bureau,State Rankings—Median Household Income, 2003. Retrieved December 25, 2007. ↑ U.S. Census Bureau, State Rankings—Persons 25 Years Old And Over With A Bachelor's Degree Or More, 2004. Retrieved December 25, 2007. ↑ Nathan Cantrell, West Virginia's chemical Industry, West Virginia Historical Society. Retrieved December 25, 2007. ↑ West Virginia Department of Transportation, Roadways. Retrieved December 25, 2007. ↑ Encyclopædia Britannica, West Virginia, Encyclopædia Britannica Online. Retrieved December 25, 2007. Ambler, Charles Henry. 1951. A History of Education in West Virginia; From Early Colonial Times to 1949. Huntington, West Virginia: Standard Print. & Pub. Co.
Ambler, Charles Henry. 1947. West Virginia the Mountain State. New York: Prentice-Hall. Becker, Jane S. 1998. Selling Tradition Appalachia and the Construction of an American Folk, 1930-1940. Chapel Hill: University of North Carolina Press. ISBN 080786031X. Brisbin, Richard A. 1996. West Virginia Politics and Government. Lincoln: University of Nebraska Press. ISBN 0803212712. Callahan, James Morton. 1923. History of West Virginia, Old and New. Chicago: American Historical Society. Campbell, John C. 1921. The Southern Highlander and his Homeland. New York: Russell Sage Foundation. Cometti, Elizabeth, and Festus P. Summers. 1966. The Thirty-Fifth State; a Documentary History of West Virginia. Morgantown: West Virginia University Library. Curry, Richard Orr. 1964. A House Divided; A Study of Statehood Politics and the Copperhead Movement in West Virginia. Pittsburgh: University of Pittsburgh Press. Davis, Donald Edward. 2000. Where There are Mountains an Environmental History of the Southern Appalachians. Athens: University of Georgia Press. ISBN 0820321257. Eller, Ronald D. 1982. Miners, Millhands, and Mountaineers Industrialization of the Appalachian South, 1880-1930. Knoxville: University of Tennessee Press. ISBN 087049340X. Ford, Thomas R., and Rupert Bayless Vance. 1982. The Southern Appalachian Region a Survey. Lexington: University of Kentucky Press. Kephart, Horace. 1976. Our Southern Highlanders a Narrative of Adventure in the Southern Appalachians and a Study of Life Among the Mountaineers. Knoxville: University of Tennessee Press. ISBN 0870491970. Milnes, Gerald. 1999. Play of a Fiddle Traditional Music, Dance, and Folklore in West Virginia. Lexington, Ky: University Press of Kentucky. ISBN 0813120802. Rice, Otis K. 1970. The Allegheny Frontier: West Virginia Beginnings, 1730-1830. Lexington: University Press of Kentucky. ISBN 0813111900. Rice, Otis K. 1985. West Virginia a History. Lexington, Ky: University of Kentucky. ISBN 081311540X. Seltzer, Curtis. 1985. Fire in the Hole Miners and Managers in the American Coal Industry. Lexington, Ky: University Press of Kentucky. ISBN 0813115264. Trotter, Joe William. 1990. Coal, Class, and Color Blacks in Southern West Virginia, 1915-32. Urbana: University of Illinois Press. ISBN 0252061195. Williams, John Alexander, and Topper Sherwood. 1993. West Virginia a History for Beginners. Charleston, [W. Va.]: Appalachian Editions. ISBN 0962748633. Williams, John Alexander. 1976. West Virginia a Bicentennial History. New York: Norton. ISBN 0393055906. Williams, John Alexander. 1976. West Virginia and the Captains of Industry. Morgantown: West Virginia University Library. ISBN 0870122371. Williams, John Alexander. 2002. Appalachia a History. Chapel Hill: University of North Carolina Press. ISBN 0807860522. West Virginia Legislature. Constitution of West Virginia. West Virginia Wild and Wonderful. http://www.wvtourism.com/default.aspx West Virginia Division of Tourism]. This page was last modified on 8 August 2013, at 14:16.